Share with your networks! Download social media graphics for each of these terms at bit.ly/2eO8E0H. COP: The Conference of the Parties, or the annual gathering of the 197 countries that have joined the UN Framework Convention on Climate Change (UNFCCC), an international environmental treaty adopted in 1992 to stabilize global greenhouse gas emissions. This year’s COP in Marrakech, Morocco is the 22nd, hence COP22. Party: A country or regional group (like the EU) that has joined a particular international agreement, such as the UNFCCC or the Paris Agreement. Paris Agreement: An international climate change agreement under the UNFCCC adopted by 196 Parties last year at COP21 in Paris. Long-term goals: The global targets established by the Paris Agreement. They include limiting global temperature rise to well below 2 degrees C (3.6 degrees F) and pursuing efforts to limit it to 1.5 degrees C (2.7 degrees F) above pre-industrial levels, and achieving net-zero emissions (where greenhouse gas emissions do not exceed what the world’s carbon sinks can absorb) in the second half of this century. All Parties to the Paris Agreement have agreed to take action in their own countries to collectively achieve these long-term goals. 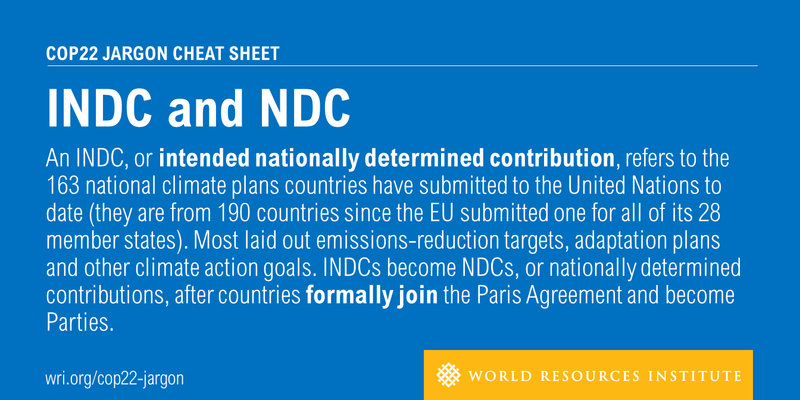 INDC and NDC: An INDC, or intended nationally determined contribution, refers to the 163 national climate plans countries have submitted to the UN to date (they are from 190 countries since the EU submitted one for all of its 28 member states). Most laid out emissions-reduction targets, adaptation plans and other climate action goals. INDCs become NDCs, or nationally determined contributions, after countries formally join the Paris Agreement and become Parties. Ratification, Acceptance and Approval: After Parties adopted the Paris Agreement at COP21 in Paris, they needed to formally join it. Parties do this by completing whatever domestic approval processes their countries dictate for international treaties, and then submitting a formal document to the UN, known as an instrument of ratification, acceptance or approval. So far, 97 Parties representing almost 70 percent of global emissions have ratified the Paris Agreement. There will be a ratification event during COP22 where countries that have not yet ratified will have the opportunity to do so. Entry into Force: When the Paris Agreement goes into full effect. This happens 30 days after 55 countries representing at least 55 percent of global greenhouse gas emissions join the Agreement. Entry into force occurred on November 4th, years before many expected it to. 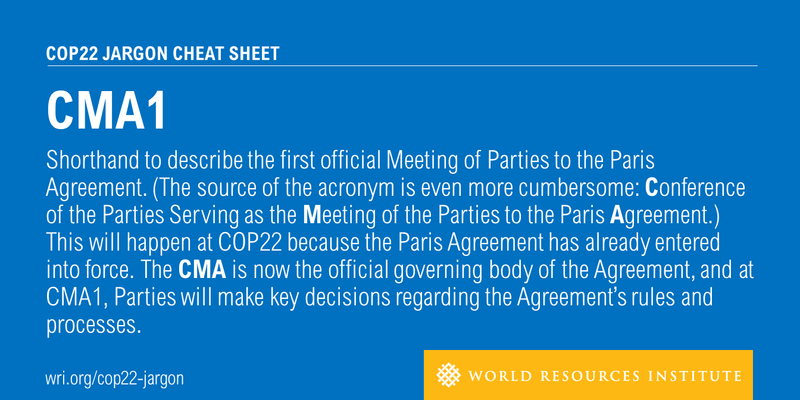 CMA1: Shorthand to describe the first official Meeting of Parties to the Paris Agreement. (The source of the acronym is even more cumbersome: Conference of the Parties Serving as the Meeting of the Parties to the Paris Agreement.) This will happen at COP22 because the Paris Agreement has already entered into force. The CMA is now the official governing body of the Agreement, and at CMA1, Parties will make key decisions regarding the Agreement’s rules and processes. Suspension: While CMA1 will occur in conjunction with COP22, many expect it to be extended and picked back up at subsequent COP meetings. This will give Parties more time to hammer out the rules and procedures of the Agreement, which are critical to its successful implementation. Parties may also agree to a fixed date when CMA1 will conclude. Modalities, Procedures and Guidelines (MPGs): Essentially the rulebook that needs to be developed to provide Parties with the guidance needed to implement the various elements of the Paris Agreement aimed at achieving its long-term goals, including ones on transparency, NDCs, and other issues. These MPGs will be negotiated by the Parties over the coming years. UNFCCC bodies: In addition to the COP and CMA, a number of other bodies are key to developing the MPGs. These are the APA (Ad Hoc Working Group on the Paris Agreement) which was a negotiating body established at COP21 to prepare for entry into force of the Paris Agreement and SBI (Subsidiary Body for Implementation) and SBSTA (Subsidiary Body for Technological and Scientific Advice), bodies established under the UNFCCC to provide technical support to the Parties. Ambition Mechanism: The various elements of the Paris Agreement that combine to increase ambition of climate action over time to ensure the long-term goals of the Paris Agreement are achieved. Global Stocktake: The collective moment to take stock of progress towards achieving the long-term goals of the Paris Agreement. It will occur every five years, beginning in 2023, and will inform the submission of new NDCs. Facilitative Dialogue 2018: The first moment where countries will have the opportunity to take stock of initial progress and inform the updating or submission of NDCs ahead of 2020. Parties have yet to identify a process for designing what this moment will look like. The agenda for Facilitative Dialogue 2018 will feature prominently in discussions at COP22. $100 Billion Goal: A target established in 2009 at COP15 in Copenhagen, where developed countries committed to mobilize $100 billion a year of financial support by 2020 from public and private sources in order to help developing nations mitigate and adapt to climate change. The $100 Billion Roadmap refers to the developed countries’ plan, requested at COP21 in Paris, and released in October this year, for how they will increase the level of finance from public and private sources to meet the goal. Adaptation Fund: A fund created in 2001, the last time the COP was in Marrakech, to support adaptation projects in developing countries. It was designed to serve the Kyoto Protocol, but with the Protocol’s commitment period ending in 2020, the Fund’s future is uncertain. At COP22, countries will consider whether and how the Adaptation Fund can support the Paris Agreement. Non-state Actor: Any non-country entity, such as a city, a business or an industry group. Because NDCs alone won’t limit global temperature rise to 1.5–2 degrees C, climate action from non-state actors is critical. Global Climate Action: The official COP22 platform for non-state actors to announce their climate initiatives. This platform was previously known as the Lima-Paris Action Agenda. 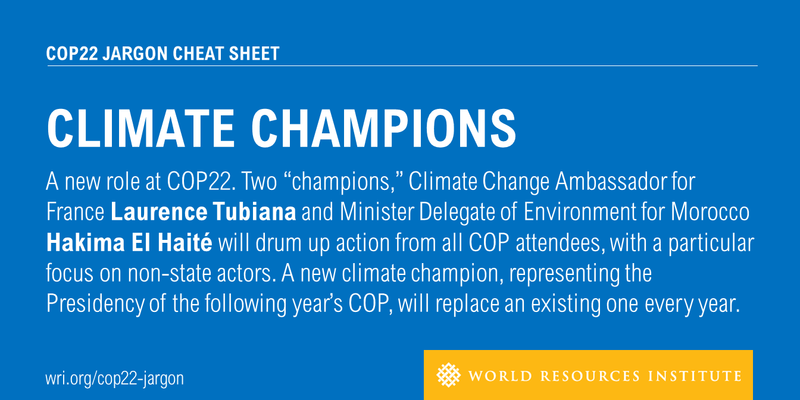 Climate Champions: A new role at COP22. Two “champions,” Climate Change Ambassador for France Laurence Tubiana and Minister Delegate of Environment for Morocco Hakima El Haité will drum up action from all COP attendees, with a particular focus on non-state actors. A new climate champion, representing the Presidency of the following year’s COP, will replace an existing one every year. Eliza Northrop, Joe Thwaites, Cynthia Elliott and David Waskow also contributed to this blog post.